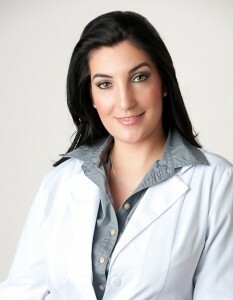 Nikolett is an adult Acne Specialists and a holistic skin care expert with a 95% success rate clearing acne. 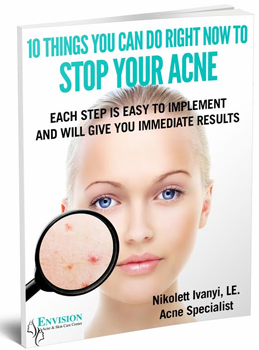 Nikolett and her team can clear any type of acne you are struggling with. Her unique, natural approach will teach you on how to eliminate those triggers that are causing your acne and by following her Acne Free Skin Program you will be able to maintain clear, acne-free skin for the rest of your life. Nikolett Ivanyi is the founder and owner of Envision Acne and Skin Care Center she is the creator of the PoreInfusion Skincare line of products and the Acne Free Skin Program. She is a Licensed Aesthetician and a Certified Acne Specialist. Nikolett is a holistic skincare expert focusing on clearing one of the most difficult skin condition: adult acne. Her philosophy is, that with education and the right guidance everybody is capable of achieving beautiful skin. She is a strong advocate for thoroughly educating and empowering her clients to understand their unique skin condition and teaches them how to care for it. Through continuous education, experimentation, trial and error, Nikolett has found an extremely effective Acne Free Skin Program and a results-oriented home care protocol which will clear acne without the use of prescription medications and antibioitcs. Envision Acne & Skin Care Center is specializing in natural adult acne treatments. Envision Acne & Skin Care Center is specializing in adult acne treatments. We focus on creating a serene and therapeutic environment while providing treatments and products that deliver visible results! How long have you been treating acne and how did you come to be an acne specialist? To answer this question, it probably best that I share with you a defining moment in my life. A “compelling story” that brought me to where I am today, coaching people like you on exactly what to do to get clear skin. The defining moment in my life happened when I was 24 years old. This was the first time in my life when I started to experience bumps and breakouts all over my face. Of course, at that time, I had no idea what was going on with my skin. I went through all of my teenage years and most of my early adulthood without having any problems with my skin. Besides, I was always known to have beautiful skin. First, I tried to change my moisturizer thinking I might be just having an allergic reaction. That did not work much to my dismay. My breakouts somewhat subsided, but the bumps were still all over my cheeks and jawline. I felt embarrassed by my skin and tried to cover it up with as much makeup as I could. I probably don’t have to tell you that it just made my condition worse. So I started to look for solutions. I tried many different products on the market, visited countless spas, aestheticians, used prescription medication and spent hundreds of dollars but I never got the results I really wanted. My skin would clear up for a couple of weeks and the acne would come back. So, one day I was lying in my bed looking at old pictures of myself. I had no makeup on and my skin looked beautiful. At that moment, I decided, no matter how long it takes I will find a solution to get my clear skin back. That’s how my journey started in the field of professional skin care. I went to esthetic school and became a licensed aesthetician. I read every book on acne and skin care I could get my hands on. I then took every course that was available for advanced skin care. I trained with one of the most sought after acne clinics in California. I learned about nutrition and how hormones affect the skin. After years of research, I finally figured out how to keep my skin clear and maintain the results. I essentially became an expert on how to get clear acne free skin. I have since made a commitment to dedicate the rest of my professional life to help others who suffer from acne. My goal is to clear up your skin in record time and to control your acne so you can live a happy and healthy life without any frustration and embarrassment. My clients are mainly adult women who are dealing with acne and hormonal breakouts and looking for a natural and holistic solution to clear up their skin. I also work with some very mature young adults who are committed to learning how to get their acne under control and willing to make some dietary changes and follow a customized skincare routine. Many clients who come to me have tried everything to clear up their skin: over the counter products, prescription medications, antibiotics, even Accutane but never gotten lasting results. My unique Acne Free Skin Program has helped hundreds of women achieve clear, acne-free skin and transformed their life. I know the best way to achieve clear skin. You will have your own Acne Specialist who will give you step by step directions throughout the process. All you have to do is just follow the steps to get clear, acne free skin. Achieving acne free, clear skin is not an overnight process!!! It requires patience and compliance. But if you follow my recommendations and be consistent with your home-care, you will achieve great results. How are you different than other skin care professionals? I and my team are very compassionate and empathetic with all of our clients. Most of our therapists at our clinic have suffered from acne so we know what you are going through. We will be there for you every step of the way to guide you through all the steps you need to take in order to get the clear skin you deserve. We ONLY treat clients with ACNE related skin problems. We clear acne WITHOUT using prescription medications and antibiotics. We have developed a system a unique Acne Free Skin Program that has a 95% success rate clearing up acne. We are unlike busy doctors who don’t have the time to spend and hour with you to evaluate your complex skin problems. We take our time with you to listen to all of your skin concerns. We monitor your progress and always return a phone call or email whenever you need assistance with the program. We encourage you to contact us whenever you feel you are not on the right track or something is not working with your skin. We work with the best acne products available to treat your skin. The PoreInfusion Skincare Products will not only clear your acne but also help heal your scarring and rejuvenate your aging skin. All products and treatments will be customized for your skin and acne type. As your skin changes, we will make adjustments in your at home skincare routine so we can assure that your skin will stay hydrated and heal completely. We will be in close contact with you throughout your process of getting clear. This will include personalized home care products, customized treatments if you are local, follow up phone conversations and email support anytime you need. Our priority is to get your skin clear in record time. What type of personality do you work best with and what is expected from me? The Acne Free Skin Program and PoreInfusion products were created for people who are absolutely excited and serious about getting their acne under control. They are ready to end their struggles and frustrations of being embarrassed by their own skin and they are willing to make some necessary dietary and lifestyle changes to clear up their skin. They were created for you to get your skin clear, which will eventually lead you to regain your self-confidence, look better, feel better and live a better life. We know the best way to achieve clear skin. You will have your own Acne Specialist who will give you step by step directions throughout the process. All you have to do is just follow the steps to get clear acne free skin. Achieving acne free, clear skin is not an overnight process!!! The clearing process usually takes 3-6 months and it requires patience and compliance. But if you follow our recommendations and be consistent with your home-care, diet and lifestyle you will achieve great results. Consider it to be a learning course as well. You will be expected to take serious and consistent action. No excuses anymore, just a different way of taking care of your skin and full support while you achieve this incredibly exciting goal: clear, acne free skin in record time. Even though I would love to help everybody who suffers from acne it is my previous experience that there are certain personalities that this program will not work for. You think that you already know how to treat your skin and don’t need a professional advice. You are not comfortable experiencing some dryness and occasional break-outs during the clearing process. You are not ready to let go of control and follow my advice. If you’re not 100% committed then we can’t work together. This program only delivers results to those that commit to every aspect of the program. If you are not willing to make some necessary dietary or lifestyle changes that are contributing to the inflammation in your skin. This program is not suitable for teenagers. If you don’t have a certain maturity level of following a professional advice this program is not for you. If you are in financial despair (it is ok, we all have been there) and can’t afford to invest in professional products and services. In this case, I recommend you to sign up for our email newsletter and follow us on Instagram where I share many great tips on how to start eliminating acne from your life. I take my profession very seriously and provide you with all the guidance you need to achieve clear skin, but it is my experience that if you are not 100% committed to the program you will never achieve the results you are looking for. What exactly is The Acne Free Skin Program and what does it include? The Acne Free Skin Program works by determining the type of acne you have, the type of skin and how fast it adapts to the products. The program consists of bimonthly acne treatments, a progressive home care protocol and close communication with your acne specialist. It is very important to keep pushing the skin to clear with products that penetrate the pore where acne starts to develop. It is also important not to push the skin past its tolerance. We don’t want your skin to be dry and irritated. Every time you come in for a treatment we do a gentle exfoliation and extractions to help clear up the skin. The products we use help calm the skin and prevent new acne lesions from forming. In about three months your acne is under control. You will look better, feel better and regain your self-esteem! The techniques used in our Acne Free Skin Program are based on the research, teachings, and methods of Dr. James Fulton Jr., M.D., Ph.D. and Laura Cooksey. Dr Fulton is a scholar, living legend in the skin care community, and world renowned acne skin care expert. He is an esteemed published research scientist and the founder of the Acne Health Care Centers as well as the nonprofit Acne Research Institute. Laura Cooksey is a licensed aesthetician and the founder of Face Reality Acne Clinic. Laura has been running her acne clinic for years with tremendous success treating acne. Thanks to the passion and lifelong pursuit of acne research of these two wonderful pioneers, I am able to pass along their knowledge and help end the suffering of those afflicted with acne. What results do I get working with you? –>Achieve Clear Acne Free Skin in only 10-14 weeks. –>Reduce the size of your pores and have a more even looking skin tone. –>Reduce shine and oiliness which contribute to bumps and breakouts. –>A complete clearing of your skin even if you have been suffering from the worst cases of acne or cysts. –>To have the great support system of an acne specialist who will be there for you every step of the way to beautiful, clear skin. –>Receiving a lot of compliments from friends and family on how great your skin looks. –>To gain self-confidence and a more positive attitude, even if you’ve struggled with acne for years. Many people experience a significant improvement of self-esteem and quality of life with the improvement of acne. But most importantly what you can expect is clear skin in record time so you can look better, feel better and regain your self-esteem quickly! Honestly, it depends on the severity of your acne and your level of commitment to the program. Knowing the type of your acne is an important step in treatment. All acne types require different treatment methods. Clients with inflamed, cystic acne tend to clear up completely within 90 days if they are following our dietary and lifestyle recommendations. The toughest kind of acne to get under control is severe noninflamed acne. It does not look as bad as the inflamed acne, but requires more exfoliation and it takes some more time to clear. Non-inflamed acne can be one of the most frustrating types of acne to manage, but if you do your homecare exactly how we outline and come in every two weeks for a treatment you will most likely be clear in about 3-6 months. Some people might take a little longer depending on the nature of their acne. Based on everything I’ve read and heard about you, I know you’re the one I want to work with. How do I get to start working with you? Congratulations on making a decision for success! We are happy to work with you to achieve clear skin! To get started with the Acne Free Skin Program, to clear up your skin, regain your self-confidence and start to live a better life, we recommend you make an appointment right now! Share with us your struggles with acne, ask questions, talk about solutions and get started to achieve clear skin.